NFC Chip - Near Field Communication Chips - A Good Investment? Motley Fool says NFC Chips could be the next great investment. New photos show alleged location of NFC chip on the iPhone 5. This chip will make mobie wallet apps and other Near Field Communications possible. The future is here! NFC Chip Readers (AKA Contactless Readers) for credit card processing, are seen at McDonald's, Best Buy, and lots of other big retail locations, but you can get the same effect with many PIN pads (Like the First Data FD35) which are out on the market right now. 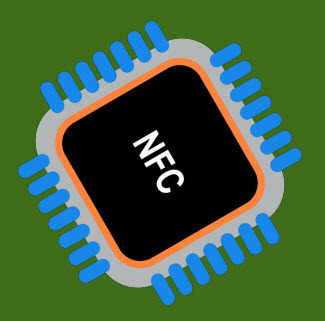 NFC Chip technology, or Near Field Communication Chips, are short-range wireless chips that can be used to transfer information from one mobile device to each other. Mobile wallets, which are apps that handle credit card transactions, are expected to be the biggest users of NFC technology, and these chips are rapidly being incorporated into smartphones and credit card terminals. Games, computers, and other input terminals are also employing Near Field Communications chips in order to share data and gain more actionable metrics on everything from proximity to access control. In the future, it is very possible that your phone will not only be used to pay at the register but also act as a wireless boarding pass, key for your front door (or car), and driver's license. NFC chips might also be used in novel applications like implanted medical devices, and the act of "tethering" your phone to a USB cable might become a thing of the past. Consumers are warming up to the potential of near field communications, since they can now share photos and other information by placing phones back-to-back. With the proliferation of mobile wallets, the interest in chips has increased especially following data breaches which are showing the downside of having an easily copied magstripe credit card. Readers at major retailers include "chip and PIN" EMV solutions as well as the contactless transceiver chips which are expected to power uncounted billions of dollars in transactions over the coming years. Tomorrow's consumer may only be carrying a smartphone for identification and payments, so the future for these microchips is getting brighter by the day. Most of the time people think of NFC chips, they are considering having a smartphone sharing information with a similar mobile device, or synching up with a computer that is also NFC chip enabled. However, very simple devices can also have NFC chips, so a thumb drive, memory stick, or SD card may also have NFC technology available to transfer information. Because of the nature of NFC communications, only one device may need to be powered, so NFC communication could be done with chips embedded in ID cards, stickers, or keychains. When both devices have power, NFC chips can be used for P2P (Peer-to-Peer) communications. Mobile payments are one of the biggest potential uses for NFC chips, since you could essentially turn your phone into a credit card, and pay at retailers who have NFC technology enabled, similar to the way you can make payments with RFID enabled credit cards right now. Beyond that, the smartphone or mobile device enabled with an NFC chip could also serve as a "ticket" to board a plane, attend a show, or get into a hotel room. Practically any activity that involves keys or identity documents could be enabled for NFC chip recognition, improving efficiency and security, so long as there is some way of proving that the person who holds the NFC enabled phone is the actual owner. Nokia C7 and the Nokia Astound and Nokia Oro variants, with the NFC feature enabled starting with the Nokia BELLE release of the OS. Special note: NFC chips may not be the security nightmare that people envision, given that they are using an encrypted code that does not pass the credit card number itself in order to make payments. Some NFC chip payments may also utilize PIN numbers as an added form of security, so even if someone steals your phone or NFC credit card, they will still need to know a PIN number to drain your account. Should you invest in NFC Chip manufacturers? How should I know? Many people are seeing dollar signs if Apple uses Near Field Communications in its devices for Apple Pay, and certainly there is something to be said for betting on technology, but as we all know a lot of big companies can lose billions of dollars at a sitting if some competitor starts dumping low-cost hardware on the market. Perhaps the answer is to invest in whoever holds the licensing, but this site is not qualified to offer investment advice, since after all any non-FDIC investment can lose value, and the author not only has no investments in NFC, he has no investments other than an underwater mortgage and a speculative media collection.